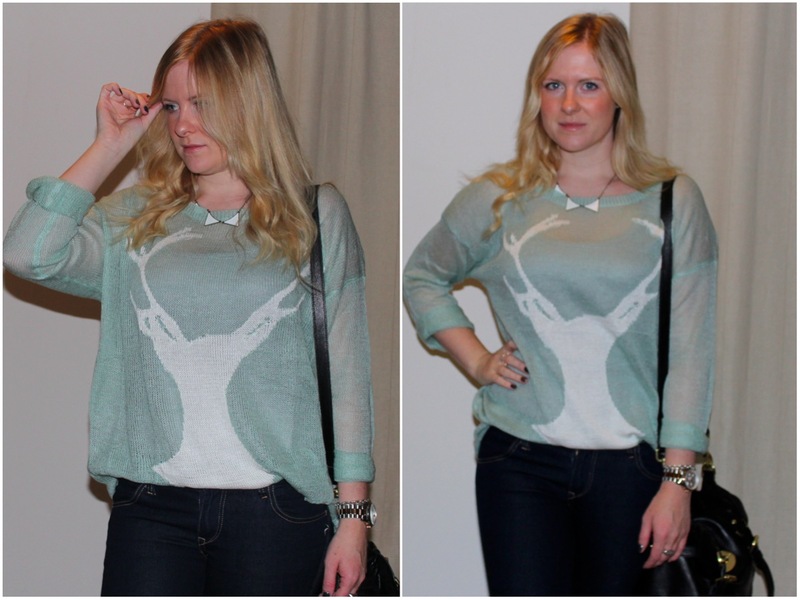 Like a deer in the headlights is pretty much the best way to describe how I look when attempting to take outfit photos for the blog. One day I’m sure I’ll master a pose, but until then I’ll opt for as many looking away from the lens as I can get away with. This is another pretty simple outfit from me – super dark blue skinny jeans (they almost look black), new jumper from Romwe* and bunting/triangle necklace from Romwe*. The jumper is very sheer so I layered it over a grey vest top. All worn with a pair of ankle boots from Primark. The jumper is a bit of a Wildfox-style one and has distressed/ripped bits around the cuffs and bottom. Because I was wearing for work and despite a pretty much wear-what-you-like dress code I thought this kinda bordered on too scruffy. So I rolled up the sleeves (tend to do this with most long sleeved things anyway) and casually tucked in the jumper at the front. My favourite thing about the jumper is the colour – I love this slightly murky turquoise shade. Despite how fine this jumper is I found it really kept me warm, with only a leather jacket over the top. Also, I mentioned the boots I wore with this – they’re not shown for this but deserve a whole dedicated blog post of their own. I love them – so comfy! Will take some pics and post on them soon. Also, little heads up that there’s a sale/discount starting on Romwe on the 26th – 1st Nov. Well worth checking out if you love a bargain! Romwe does free delivery and the prices are amazing! Plus once dispatched the goodies don’t take long to arrive at all. That is a rather lovely jumper, how much was it? Love the necklace too! There is an independant arts seller in Liverpool who carries a jewelery designer who makes knitted statement collars, and they look fab! I think they’d be quite up your street. They’re sold through Landbaby who you can find on Facebook if you’re interested at all.